Lately, I've been thinking of doing a full office redo. I'm talking new office supplies (yay), decor and revamped furniture. Thankfully, I've come across so many fabulous and inviting office design ideas online, like this gold toned office, this crisp white space, and this one with pops of pink (you can find all of my inspirations here). 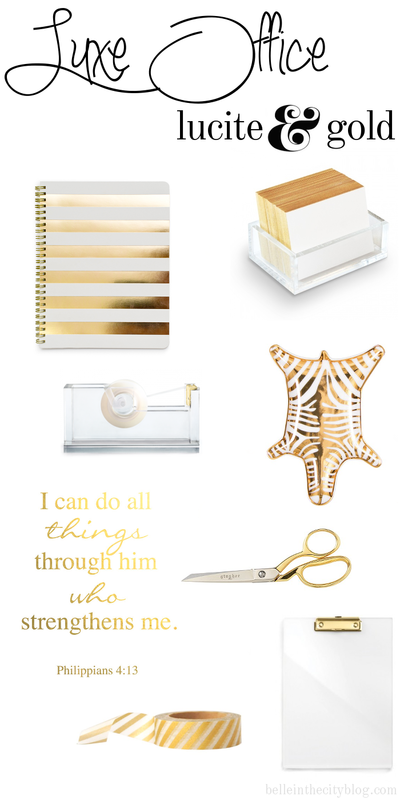 I plan on incorporating gold tones and clear lucite organizers, with a few splashes of color. What do you think are some things that should make the list for a perfect girly, luxe office?